In a previous post I used the 1966 Batman scene where Batman utilizes his "shark repellent bat spray" to escape an attacking shark as an example of when television programming has gone too far into the camp zone (an alternative to Arthur Fonzarelli's waterskiing adventure - though involving a similar aquatic beast). Dexter, Under the Dome (or just about any other Stephen King work), True Blood (to a certain extent) are meant to be a little darker, edgier, and grounded in some form of modern reality - maybe True Blood needs to be taken off that short list as the show of late has been more-or-less silly. When a show, book, movie, etc. has been created with the intension of being taken even the slightest bit seriously, any hint of over-the-top shenanigans detracts from character development, storyline, audience engagement, etc. What I failed to mention in that post is that to a certain degree, I like campy things. 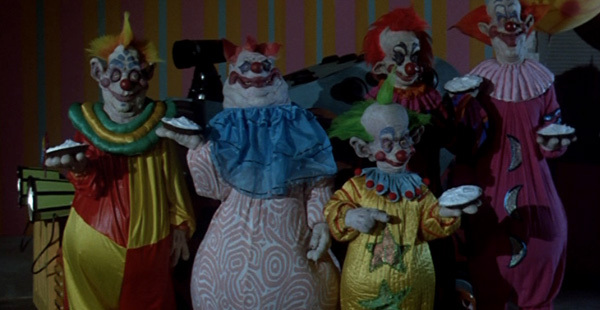 Killer Klowns from Outer Space? Sign me up! The difference here is that this movie never tries to take itself seriously. The synopsis of this 1988 horror masterpiece (per IMDB): Aliens who look like clowns come from outer space and terrorize a small town. 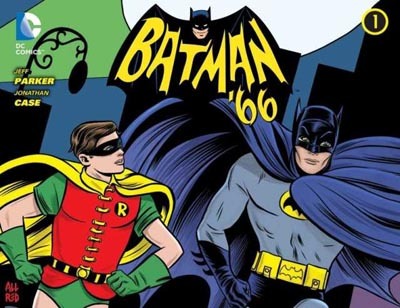 "Put on your go-go boots and get ready to "Batusi" back to the Swingin' 60s as DC Comics reimagines the classic Batman TV series in comics form for the first time! These all new stories portray The Caped Crusader, The Boy Wonder and their fiendish rogues gallery just the way viewers remember them. In this first adventure, The Riddler's out to steal some valuable artwork from under the noses of Gotham's police. But Batman gets help from an unlikely source: a certain femme fatale dressed in feline finery! This book is everything it claims to be! It includes pants-less Robin, "Holy <Insert Whatever Is Happening Here> Batman!," ridiculous fight sequences (on a crashing plane in one instance), remarkable unintentional (but really intentional) humor, pre-commercial "IS THIS THE END OF THE CAPED CRUSADER? !," and unbelievable (literally) escapes! A must read for those who like their fancy meals, but also like their cheese. Not crazy at all. I had every intention of watching Sharknado. I just forgot to look into when SyFy was airing it. The next run isn't until August 22nd, which I have now marked on my calendar. So there may be a Sharknado post in the future.